This topic contains 16 replies, has 2 voices, and was last updated by Ryan 8 months, 2 weeks ago. Sometimes, clouds and rain can get really scary! Yes, like an atomic bomb explosion. Pictures by Bruce Haffner and Trey Greenwood on July 18, 2016 near Phoenix, Arizona. This topic was modified 2 years, 9 months ago by Strange Sounds. This topic was modified 2 years, 8 months ago by Strange Sounds. WOW! Impressive. 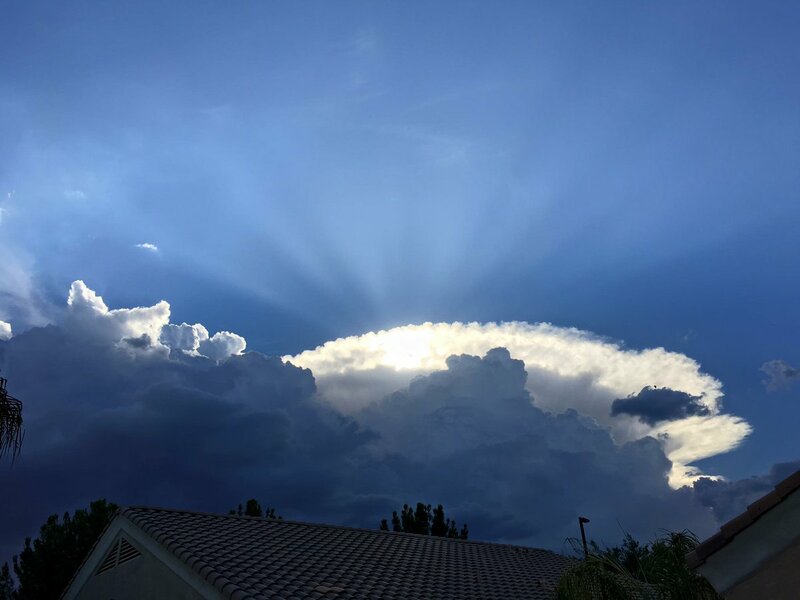 And did you see the twilight rays (and the ears of the cat) in this eerie picture by Ryan Crance over the city of Gilbert, Arizona, United States on the same day! Awesome! Sadly we may be seeing a real mushroom cloud over our cities if things dont change. richard: your dream must have scared you. i’ve had those kind of dreams myself. i’ve also awaken from dreams like that with a sad feeling.one dream i had actually came true several years later. my dream was also a “message dream” that i couldn’t understand until i saw it playing out in real life. your dream meant/means something. God tells us young men visions. old men dreams. you should feel blessed that God chose you to reveal this to us at this time. mushroom cloud over a major u.s. city? just look around you for the answer. in that moment you realize it was more than just a dream you’ll find the answer. thanks for sharing. You were from that point on to remain on your toes and ready for what is to come. You were being called/directed that very night to begin spreading the Word of what is to come to America! You were about to be shown what was coming and the condition of people (ASLEEP) when it did/does come. People (MEN) are asleep (Spiritually) and are NOT AWARE of what is soon to happen… though PUTIN is preparing (And has been for some time) to DESTROY AMERICA (aka… Babylon). Bed WITHOUT A MATTRESS… NO TIME TO SLEEP FOR YOU! YOU’RE TO SOUND THE ALARM/BLOW THE TRUMPET…. Ezekiel 1-3!!! Milling Around…. “OBLIVIOUS” to what is soon to transpire! 18 The Lord appeared to Abraham near the great trees of Mamre while he was sitting at the entrance to his tent in the heat of the day. 2 Abraham looked up and saw THREE men standing nearby. When he saw them, he hurried from the entrance of his tent to meet them and bowed low to the ground. The “3” Chiefs are your greatest confirmation that your vision was TRUE and of GOD! And more… when I picked up my Bible to look up that passage… I FLIPPED my Bible open to the VERY PAGE!!! The FIRST THING I saw was the Title Heading for the Chapter (NIV)… “THE THREE VISITORS”!!! all those who draw the bow. LET NO ONE ESCAPE (AID WOULD NOT LET THE CHIEF LEAVE). do to her as she has done. The REST you saw was the ATTACK/DESTRUCTION! You’re words that, “Jesus is coming”… was that Christ’s Will Come SOON after the FALL OF BABYLON/DESTRUCTION OF AMERICA!!!! America is BABYLON and will be Destroyed in an ALL OUT NUCLEAR CONFLAGRATION (By RUSSIA and CHINA)… in ONE HOUR!!! From START TO FINISH… it’ll LAST ONE HOUR! And it will happen and signals that beginning of the Tribulation! Isaiah 13, 14, 21 and 47 Jeremiah 50 and 51; Habakkuk 2 and Revelation 17 and 18! These are a Prophesies of America’s (The Daughter Of Babylon) Judgment and is the Dream you shared!!! Russia and China prepare for this as I write! Wow, that’s impressive. Too bad it wasn’t centered over the Krapdashians. It’s called the a cumulonimbus cloud which happens during monsoon season! Looks terrifying only because it’s an isolated formation not accompanied with other storms! OMEN? Why Arizona? It’s such a nice State, maybe opened borders? Perhaps God is telling them to vote Republican. This is a dream I had in 1985, to some I have sent it to a while back, to those that have never read this, I send this dream to you, please judge it for yourselves. The next thing I heard was a wailing noise (siren). I looked up and heard a noise and saw, it seemed like thousands of jet aircraft traveling fast with their afterburners blasting. (I was in the Air Force for four years.) There were literally thousands of them. It was dark in the early morning and I could see the flames coming out of their engines’ tail pipes. I made a comment to one of the chiefs, “There are thousands of them.” (They were fighter aircraft.) The chief was looking at me with a scared look and I said to him, “Jesus is coming.” When I said this there was a bright flash in the sky and the heavens glowed with a bright light. I fell to the ground and heard screaming of the men around me. I could feel the heat of the light around me (it was an atomic bomb) exploding in the Los Angeles area. I then woke up and had the strangest feeling of emptiness that this is going to happen in Los Angeles, IT WAS SO REAL. Infind it interesting it was the city of Los Angelos..( ciry of angels) may you are seeing a soiritual battle.. I saw today that Joe Biden making a speech in Australia said ro the group not to worry about the election( 8 paraphrase the next part but you can find it 1 hour and 6 minutes into the NBC today show 7-120-2016) hat rhe more powerful angel would win…what an odd thing for a VP to say! This is NOT an atomic bomb cloud or mushroom cloud. This is far from a cloud. 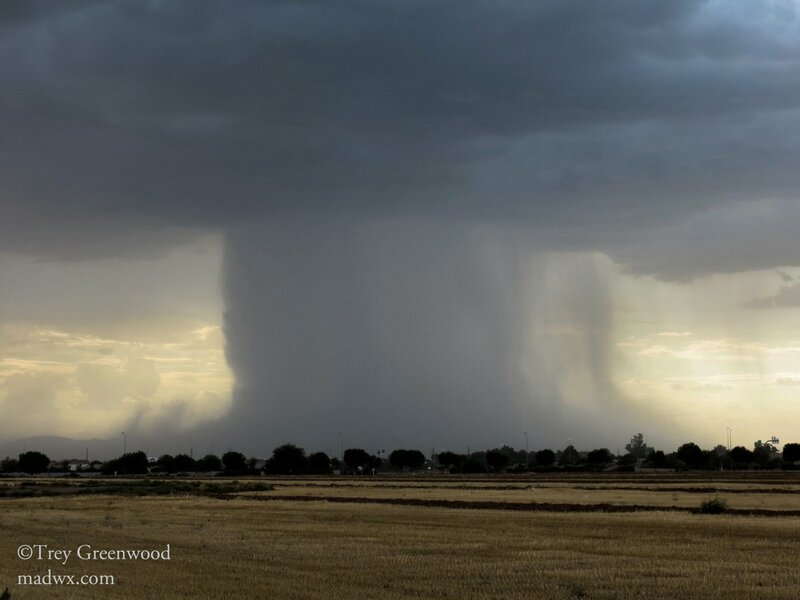 It’s a weather phenomenon called a microburst or downburst. It’s a downward wind (science term downdraft) that brings heavy rain and damaging winds in thunderstorms. Microbursts for when a storm’s downdraft is so strong that it looks like the clouds are coming down. What stuff that looks like clouds touching the ground, that’s actually very heavy rain. It flattens out at the bottom because the wind shifts parallel to the ground. That’s when the winds shift from vertical to horizontal and do a lot of damage. This is NOT an atomic bomb cloud or mushroom cloud. This is far from a cloud. 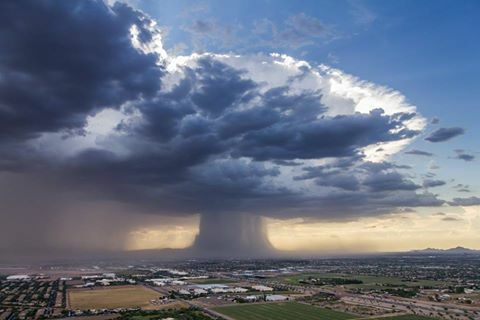 It’s a weather phenomenon called a microburst or downburst. It’s a downward wind (science term downdraft) that brings heavy rain and damaging winds in thunderstorms. 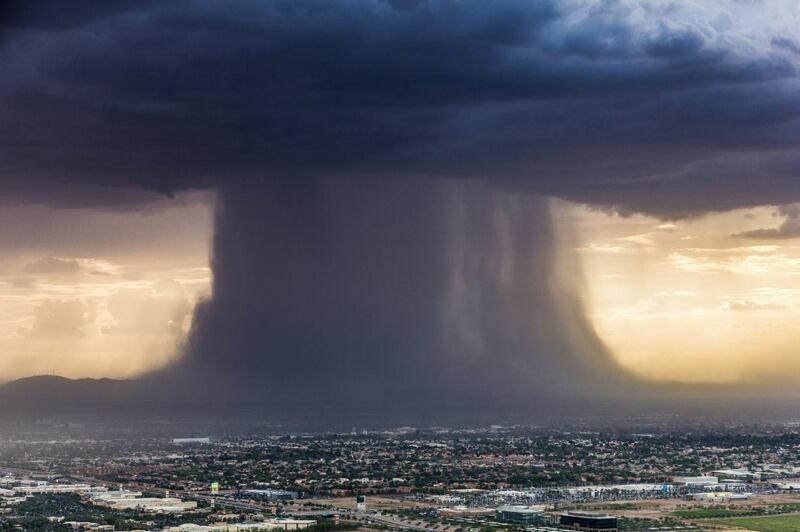 Microbursts form when a storm’s downdraft is so strong that it looks like the clouds are coming down. What stuff that looks like clouds touching the ground, that’s actually very heavy rain. It flattens out at the bottom because the wind shifts parallel to the ground. That’s when the winds shift from vertical to horizontal and do a lot of damage.